You have many reasons to open an in-home daycare-you’re great with kids, there’s a need for daycare in your area, and you have the independence and business savvy to work for yourself. You’ve made your business plan, and this move promises to be profitable as well as practical. Now is the time to get in gear and prepare for your launch by choosing the best daycare tools, equipment, and apps to support your success as an in-home childcare provider. It goes without saying that safety will be your #1 concern when it comes to choosing tools and materials for your in-home daycare. Look for durability and compliance, and always check the warranty. Stock your space with safety equipment such as a fire extinguisher, first-aid kit, and disaster equipment. Stay current on the local requirements of your country and state by visiting the National Association for Family Childcare. How many children are you planning to care for? What is your maximum, and will that number increase in the future? What area of your home will be designated for the daycare? It’s worth considering how you will separate your personal space off from your business space, including gates or other barriers to keep children safe while in your care. Once you’ve figured out where in your home your daycare will be, you’ll want to make sure to buy toys, art supplies such as fingerpaints and paper, feeding supplies such as high chairs, spoons and plates, and more. Look for products that are non-toxic and from reputable stores. Ikea is a great source of supplies that are high-quality and affordable. PRO TIP: Make sure to take exact measurements of your in-home daycare space, including the height of the ceiling, and keep them on hand while shopping for equipment. This information will help you with your larger purchases, like tables, chairs, storage units, and climbing toys. For large, infrequent purchases such as furniture, consider second-hand resources like Ebay and Facebook Marketplace. Since you are most likely starting small, you can find lightly-used daycare equipment from businesses that have expanded and/or redecorated. The second category of in-home daycare materials are the ones you’ll need on an ongoing basis, like art supplies. Get the best industry prices by shopping in bulk and through wholesale sources like Discount School Supply. The more items you can order with one click, the better. Working with as few suppliers as possible can yield rewards and discounts over time, and will save you precious time when restocking materials. Price and quality are major considerations when choosing your equipment, and the length and extent of the manufacturer’s warranty should be part of that calculation. But you also need to care for your business itself, with insurance that enables you to focus on caring for your little ones without worry. Childcare insurance is different than insurance required for other businesses. Having home daycare insurance will help you move your business forward knowing that all aspects of your business are covered. 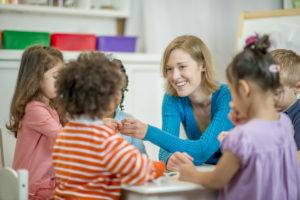 Well-run administration and responsive communication are excellent ways to show your professionalism and build trust with the parents who trust you as a childcare provider. Today, there are incredible tech tools at your fingertips to help you achieve this for your in-home daycare business-the most popular being Brightwheel. (No, we have no tie to them, we just think they’re great!) Brightwheel is a full-spectrum, mobile business platform for childcare professionals, which includes check-ins, photo sharing with parents, messaging, a shared calendar, and even billing. No more stacks of paperwork and endless photocopies in order to run your business and communicate with parents. Today’s daycare tools include the digital. There’s a lot to do when you’re getting ready to open your daycare, and you’ll want to be able to switch between tasks quickly and easily. This is why you should look for childcare marketing tools that can be managed from your phone, at low cost, in a way that reaches prospective parents in your area. Consider creating a Facebook page, and promoting it via Facebook Ads. If you aren’t ready to invest in paid digital marketing, consider sharing branded, childcare-related content in local parenting groups on Facebook, or posting pictures of your center on Instagram. Why? The answer is simple: traffic. 79% of American internet users are on Facebook and over 70% of Facebook users visit the platform daily. Many parenting groups are very active, and you can quickly establish your credibility by becoming a part of them, if you’re not already. Operating a daycare is an opportunity to combine your childcare skills with business savvy. If you do it properly, you will find yourself with a career you love and a business that enables you to live the kind of life you’ve always wanted. Commercial Auto Insurance: Now Available!